Vegan spring rolls have been a favorite of mine ever since I was a kid. Truth be told, I first fell in love with a shrimp and rice noodle version. 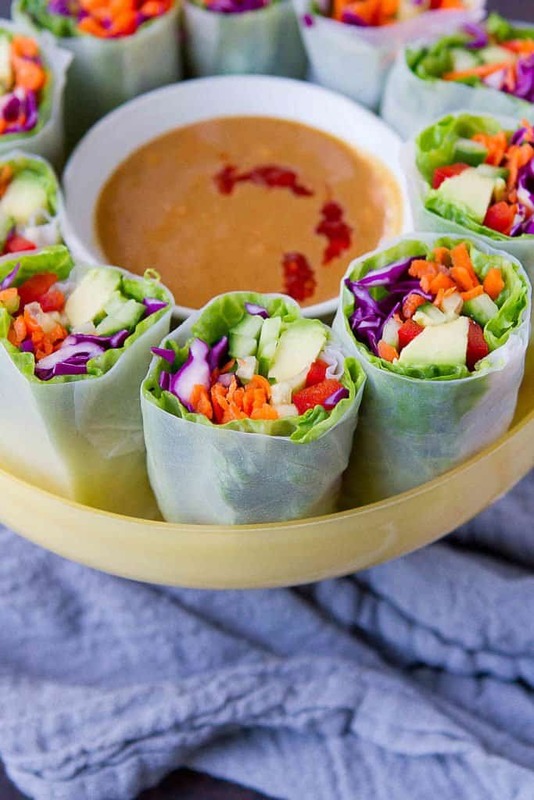 But as I got older, I realized that vegetable spring rolls were a great way to work more roughage into my diet without always turning to salads or steamed veggies. 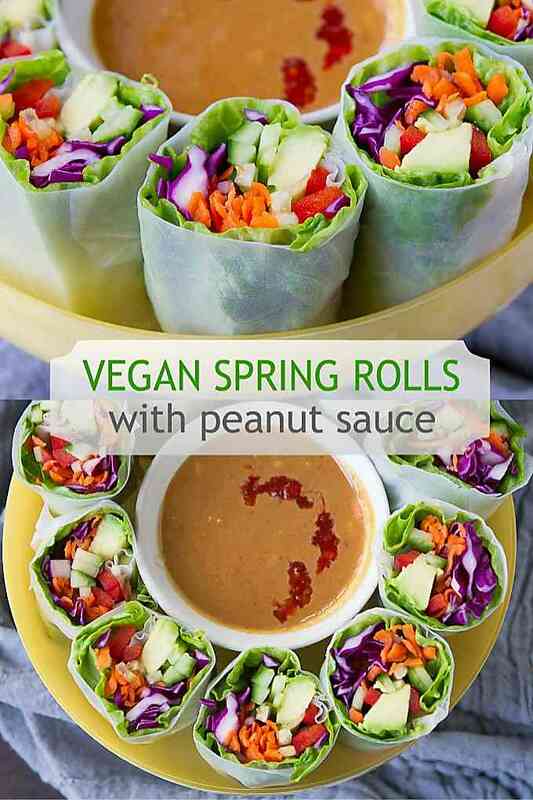 And as I mentioned in my 15 Vegan Dinner Recipes post a few days ago, I regularly try to work meatless meals and appetizers into my family’s diet, and this vegetable spring roll recipe is ideal for that! 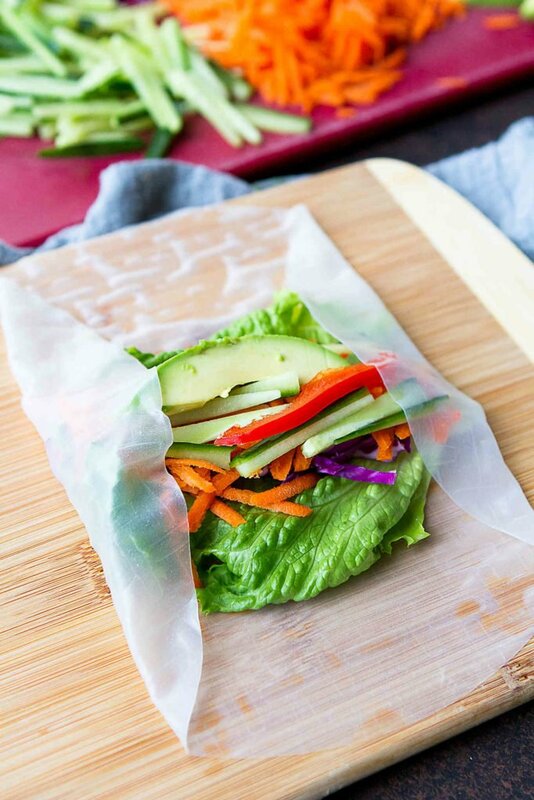 I’m including plenty of tips for working with spring roll wrappers, where to buy them and how to change up the ingredients to suit your taste buds. Let’s get rolling! If you haven’t used spring roll wrappers before, they may seem a little intimidating. But if you’ve ever rolled a tortilla into a burrito, you’re already halfway there! Start by filling a wide dish, such as a glass Pyrex baking dish, with hot water. It shouldn’t be so hot that you can’t dip your fingers into the water, but hot enough to soften the wrappers. Slide one of the wrappers into the water and soak until just softened, about 10 seconds. If the spring roll wrappers is soaked for too long, it tends to become a bit gummy and difficult to work with. Transfer the wrapper to a cutting board. Line up the filling ingredients down the center, leaving about 1 1/2 inches at each end. Fold the ends over the filling, then fairly tightly roll up the wrapper. It takes a few times to get the hang of it, so don’t give up! If you have an Asian market near you, that’s probably where you’ll find the spring roll wrappers at the most reasonable price. The wrappers can be found in the international aisle of many well-stocked supermarkets. Alternatively, the wrappers can be purchased on Amazon (affiliate link). 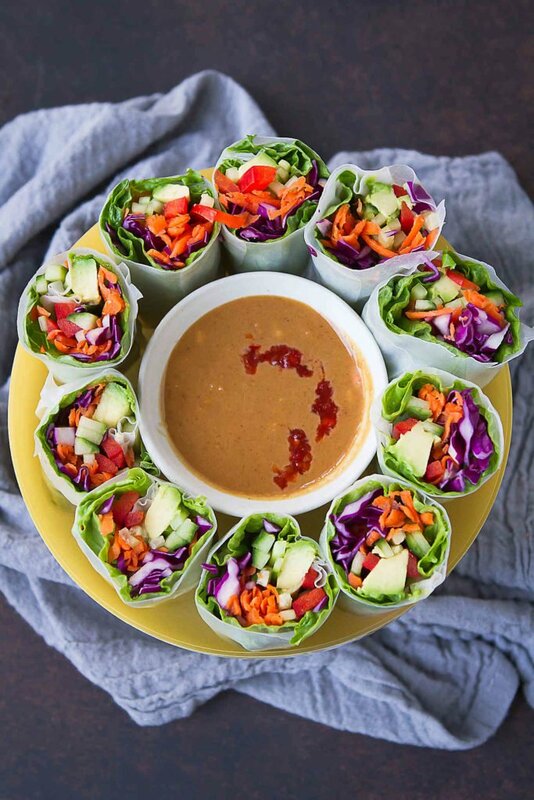 How do you make vegan peanut sauce? Most of the ingredients in peanut sauce are vegan. However, there are a couple of ingredients that pop up periodically in peanut sauce recipes that should be avoided or substituted for a vegan sauce. Honey: While you may get varying opinions on honey from some vegans, many agree that honey is not vegan-friendly. Why? Well, vegans avoid all products made from or by an animal, and bees are animals (or at least living creatures). Good substitutes for honey are agave nectar and maple syrup. Fish sauce: Since fish are living creatures, fish sauce is mostly certainly a no-no for vegan diets. It can simply be left out of most recipes, though you may need to compensate with additional soy sauce to make up for the lost salt from the fish sauce. Standard ingredients in vegan peanut sauce are peanut butter (I use natural creamy varieties), soy sauce and a sweetener (like agave nectar), plus the addition of an acid such as lime juice or rice vinegar, and extra flavor from sesame oil, chili garlic sauce and/or ginger. Start by prepping your vegetables. Chop the cabbage, slice the red bell peppers and avocado, and grate the carrots. To julienne the English cucumber, cut a 1 1/2 to 2 inch section of cucumber lengthwise into thin sections. Stack the sections and thinly slice lengthwise. Matchstick cucumber! Feel free to change up the vegetable selection to suit your tastes. Other great options are Napa cabbage, beets (grated), jicama, and microgreens or sprouts. If you are looking for a hit of protein, add tofu (baked or otherwise), beans, tempeh or edamame. Soften the rice paper wrappers and roll the ingredients inside of the wrappers (see instructions in “How to use spring roll wrappers” section above). How do you stop spring rolls from drying out? Spring rolls have a tendency to dry out quickly when left uncovered. To avoid this, place a damp kitchen towel or paper towel over the spring rolls while working on making the other rolls. 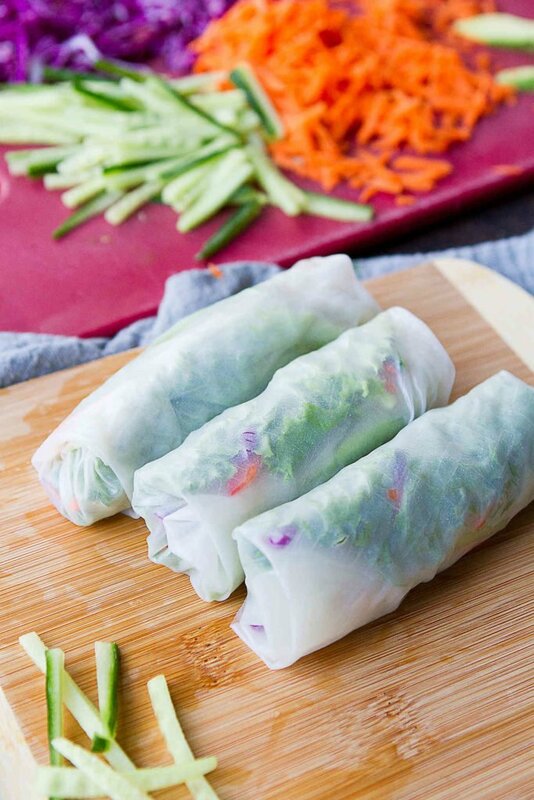 If serving later, place the spring rolls on a plate or serving dish, cover with a damp paper towel and wrap in plastic wrap. Fill a wide serving dish with hot water. Place one spring roll wrapper into the water and submerge until it’s just starting to soften, about 10 seconds. Do not submerge for too long, otherwise the wrappers will become gummy and difficult to work with. Transfer the wrapper to a cutting board. Top with a half lettuce leaf, 2 tablespoons cabbage, 5 to 6 pieces julienned cucumber, 2 tablespoons carrot, 2 slices avocado and 2 slices bell pepper. 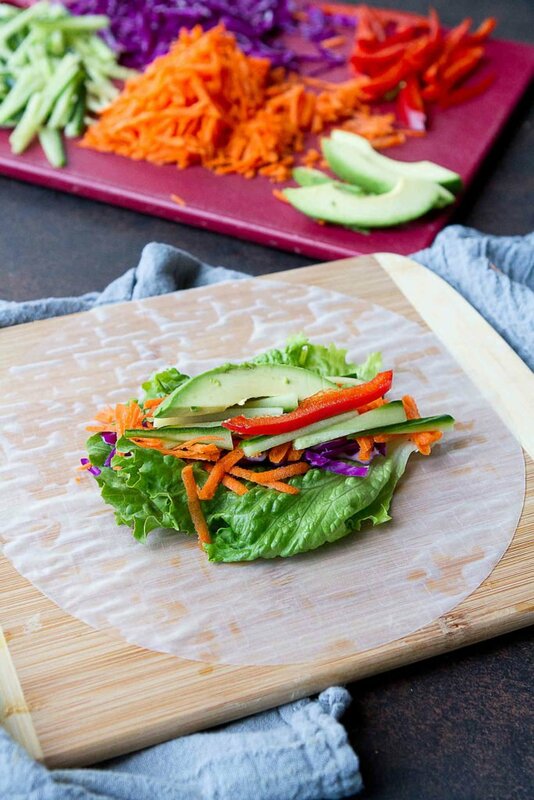 Fold in the sides of the rice paper wrapper, then roll tightly. Either serve whole or cut in half and display cut side-up. Serve with peanut sauce. In a medium bowl, whisk together the peanut butter, lime juice, soy sauce, agave nectar, rice vinegar and chili garlic sauce until smooth. « 15 Vegan Dinner Recipes – Easy & Delicious!